On Tuesday, March 5, 2013, our Heavenly Father called to himself our beloved husband, father, grandfather and great-grandfather, Uilke Tolsma. Uilke will be missed but lovingly remembered by his wife of 62 years, Johanna; 5 sons, Art (Helen), Fred (Netty), Rick (Sharon), Brian (Carolyn) and Irwin (Yvonne); 30 grandchildren and 38 great-grandchildren. Also to cherish his memory are his many brothers, sisters, nephews, nieces and friends. He was predeceased by his granddaughter, Nicole; brother, Fred; sister, Jantje; brother-in-law, John VandenBrink and sisters-in-law, Gerda and Marilyn. The family would like to thank the nursing staff at Emmanuel Home for their care and kindness shown to Mom and Dad. 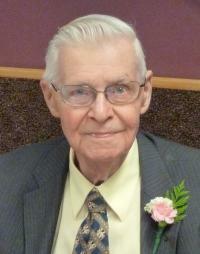 Visitation will take place from 2:00-4:00 p.m. on Saturday, March 9, 2013 at Foster and McGarvey Funeral Home, 10011-114 St., Edmonton. A Memorial Service will be held on March 11, 2013 at 1:00 p.m. at the Trinity Reformed Church, 13427-57 St. A Private Interment will be held prior to the service. In lieu of flowers, donations may be made to Emmanuel Home, 13429 - 57 St., Edmonton, Alberta, T5A 0T8.